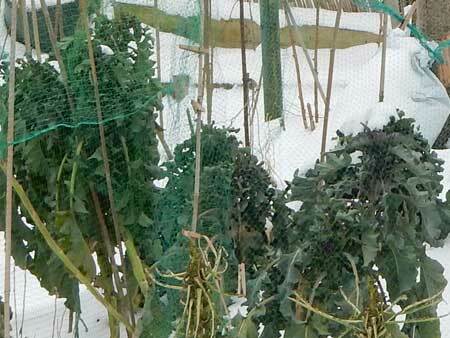 High above the snow, broccoli is still sprouting a tasty crop of purple goodness. Stir frying or steaming is the most commonly used cooking option for this brassica, but this super simple oven cooked version brings a rich tenderness to tougher stems. Cut the stems as long as you can, leaving the heads intact and place in a baking dish with a little sliced garlic and enough vegetable or chicken stock to almost cover the stems. Cover with a tight lid or foil. Bake for about 30 minutes, until soft. The colour will darken, but this is one way of bringing out the sweetness of a slightly more mature plant.